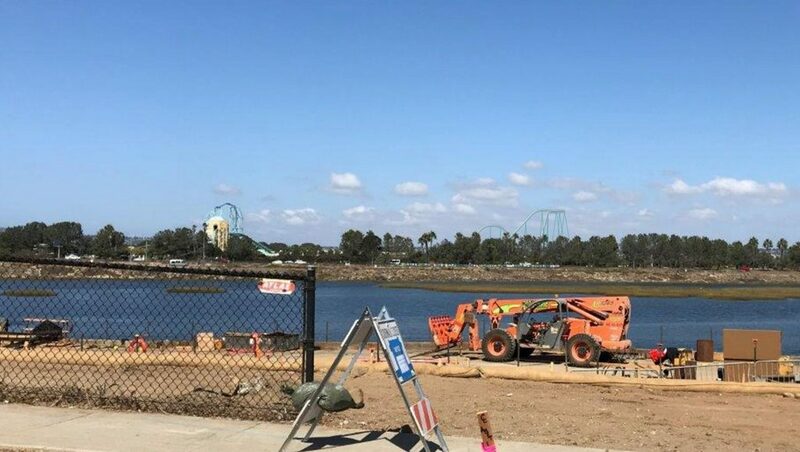 Nick: Sea World San Diego announced their 2020 plans to add Mako, a 153ft tall B&M Dive coaster earlier this month. 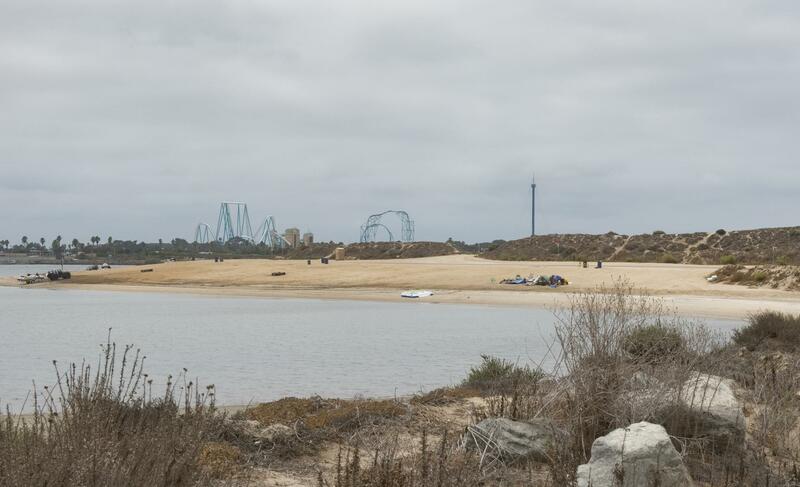 Now, thanks to a filing with the San Diego government last week, we can get a much better idea of the new ride’s layout and position in the park. Let’s take a closer look! 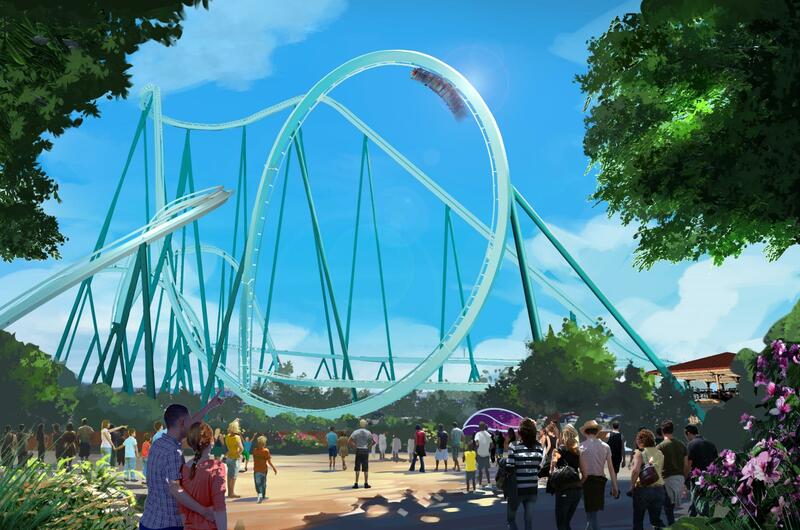 When the ride was officially announced, the only detail released was the below concept rendering showcasing the view of the ride’s signature drop and first inversion. 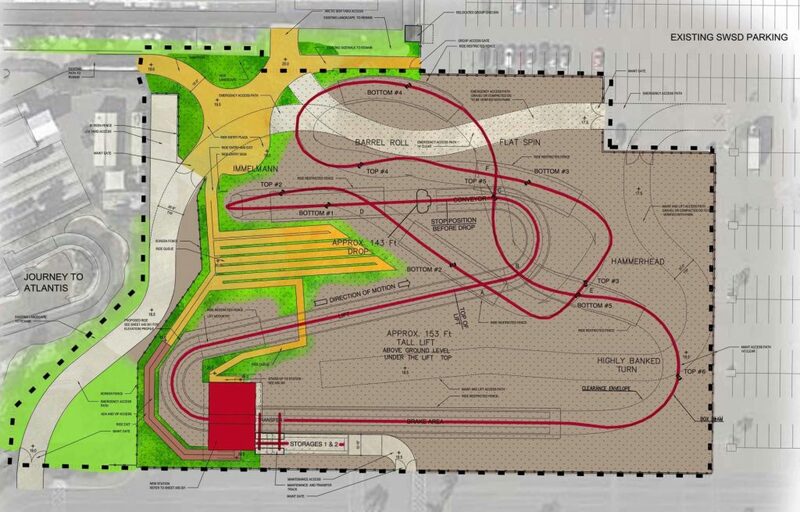 However, a recent document filed with the San Diego government contains a much more detailed analysis of the planned addition, including the an image of the ride’s layout, which very conveniently has all its elements labeled. As you can see below, the ride begins like most dive machines do, with a drop into an immelmenn. After that its up into a hammerhead turn, which should be a really fun element on a dive coaster. The ride then maneuvers through its next two inversions, a barrel roll with a swooping turn into a flat spin. Finally, there’s a highly banked turn into the brake run. The document also discusses the ride’s visual and sound impacts on the surrounding area, specifying that the trains will only hold 18 riders each, which confirms it will have the smaller, 6-across seating arrangement. The below rendering was also included to illustrate the colors choices of the track and support to help the ride blend in with the sky. And finally, two simulations were rendered to show how the attraction would affect the park’s skyline and its visibility from various off-site locations. Coaster fans have already done an amazing job re-creating this layout in simulation games like No Limits, so we’ve included this video by CoasterMac305 which gives you an excellent idea of how the final product will look! Overall, we’re thrilled for this new addition to Sea World San Diego. It looks like a solid ride, and will give this park a great lineup of coasters! We can’t wait to see what else they have in store for the future! Thanks for reading! For more Sea World coverage, check out our construction tour of the new Sesame Street land coming to Sea World Orlando next year!